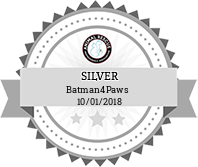 Batman4Paws is a 501(c)(3) non-profit organization that rescues and transports dogs, cats, and other animals in need to furever homes, no-kill facilities, and foster homes throughout the state of Florida and beyond. Transports are done personally by Batman himself. Contact Chris Van Dorn at 407-496-8740.